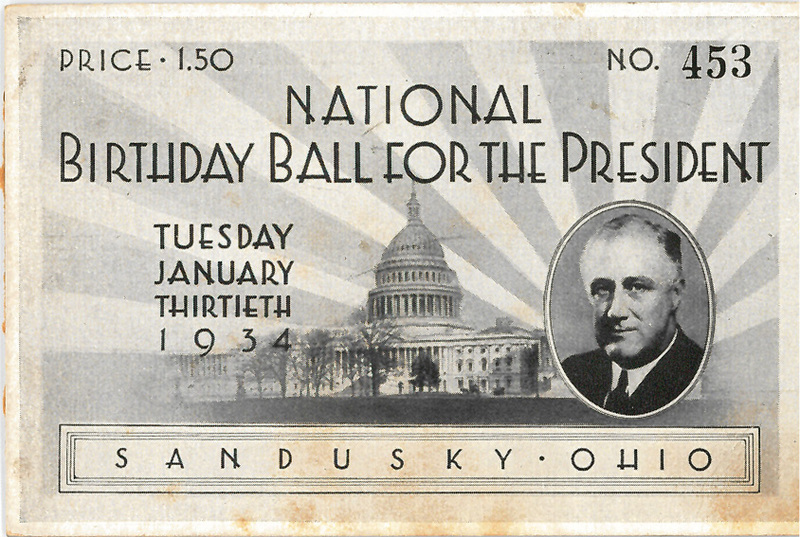 From 1934 through 1942, balls in honor of Franklin D. Roosevelt’s birthday were held in Sandusky, Ohio. 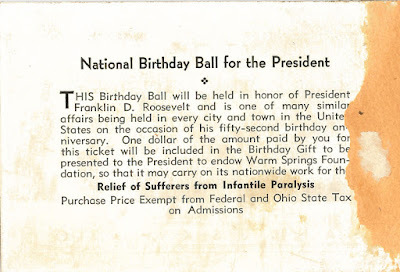 Sponsored by the National Committee for Birthday Balls, a portion of the proceeds from the dances went to the Warm Springs Foundation for their work for the sufferers of infantile paralysis, a disease that had had seriously impacted President Roosevelt himself. 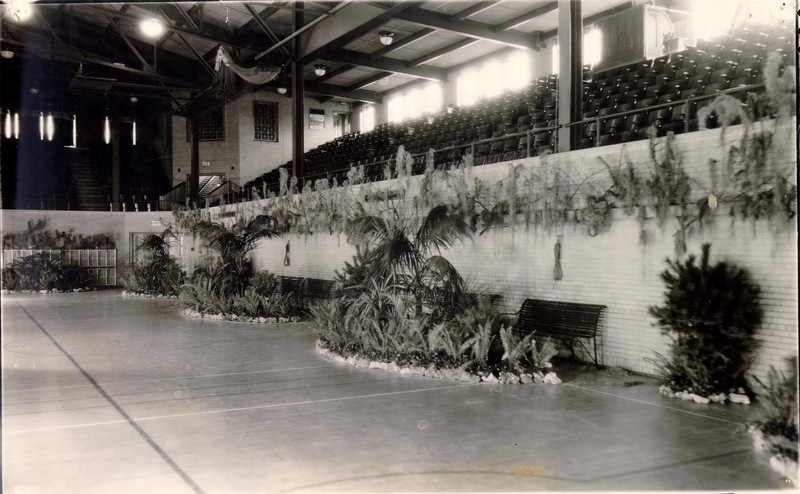 In 1934 and 1935, the National Birthday Ball for the President was held at Jackson Junior High School. The gymnasium was decorated to resemble the Georgia Hall at Warm Springs. 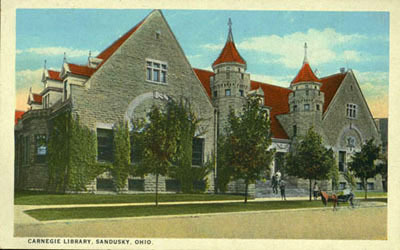 On the morning of January 31, 1934, assemblies were held in Sandusky schools, to educate the students about the history and work of the Warm Springs Foundation. Each youngster was asked to donate one penny as a contribution to the Foundation. 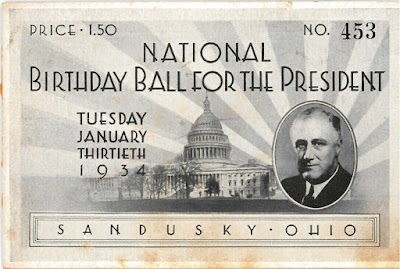 In 1934, Sandusky residents raised $623 at the Roosevelt Birthday Ball. Nationwide there were 600 celebrations, which raised over one million dollars for the Warm Springs Foundation. 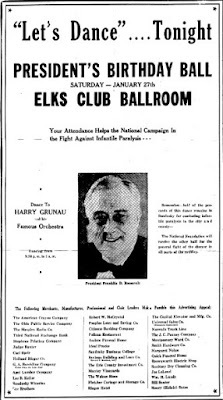 Beginning in 1936, and continuing until 1942, most years the Roosevelt Birthday Balls were held at the Elks and Eagles Lodges. 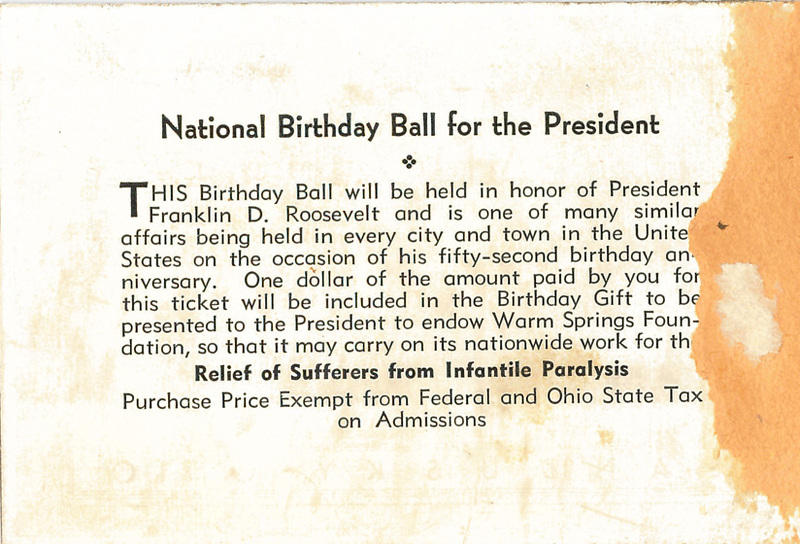 In 1942, the Plum Brook Ordnance Works sponsored a Birthday Ball for the President at Rainbow Garden in Fremont. Irving Berlin composed a song in 1942 in honor of the President’s Birthday. Below is a copy of an announcement for the 1940 President’s Birthday Ball from the January 27, 1940 issue of the Sandusky Register. Today the March of Dimes Foundation continues to raise funds used to improve the health of women and infants.